Now that spring has graced its presence upon us, a lot of us begin to have that craving for ice cream or slurpees. But what about this frozen yogurt, or froyo, craze that everyone keeps talking about? Frozen yogurt is exactly like it sounds. It is frozen yogurt that comes in multiple flavors, but you put on your own toppings, which could be candy, fruit, cakes, syrups and so much more. In Greensburg, Pa., we are lucky to have one of the most adorable frozen yogurt establishments out there: sweetFrog. Created in 2009, the sweetFrog company has been serving customers across America, and even some in the Caribbean and in Europe. So, why does the establishment have frogs as their mascots? “The F.R.O.G. in sweetFrog stands for Fully Rely On God, and we show that by being a good neighbor everywhere we move into,” says the sweetFrog website. The website also says that they named their two frog mascots Scoop and Cookie. Another reason why sweetFrog is unique from other frozen yogurt restaurants is that they offer flavors in nonfat, low-fat, no sugar added, supreme and sorbet. Plus, the company states that their frozen yogurt has health benefits: it increases metabolism, contains vitamins and nutrients, and is made fresh every day. 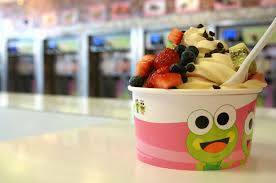 The franchise also offers its loyal customers the opportunity to join sweetFrog Loyalty program. When a customer orders a frozen yogurt, they then can get their virtual card punched, which will be one step closer to getting special deals. Once a customer gets to a certain amount of punches, they can receive rewards from sweetFrog. As for the Greensburg location itself, the store is decorated with blue, green, and pink paint to match their frogs, Scoop and Cookie. At the store, you can purchase stuffed animals of Scoop and Cookie, and sweetFrog apparel. To visit sweetFrog, you can go to their location on Route 30. On Mondays through Thursdays, they are open from noon to 9:30 p.m. From noon to 10:30, you can go on Friday and Saturday, and on Sunday they are open from 1 p.m. to 9 p.m.